The ultimate plan is to get a muzzle-device so I can suppress it. Last edited by AndyC on Sun Dec 17, 2017 3:42 pm, edited 1 time in total. I’ve had mine for a while and it makes a great truck gun. Very nice, similar to a build I just finished, except mine is chambered in 5.56. Still need an optic and flashlight, but this will be mostly used as a home defense weapon, and for some plinking. 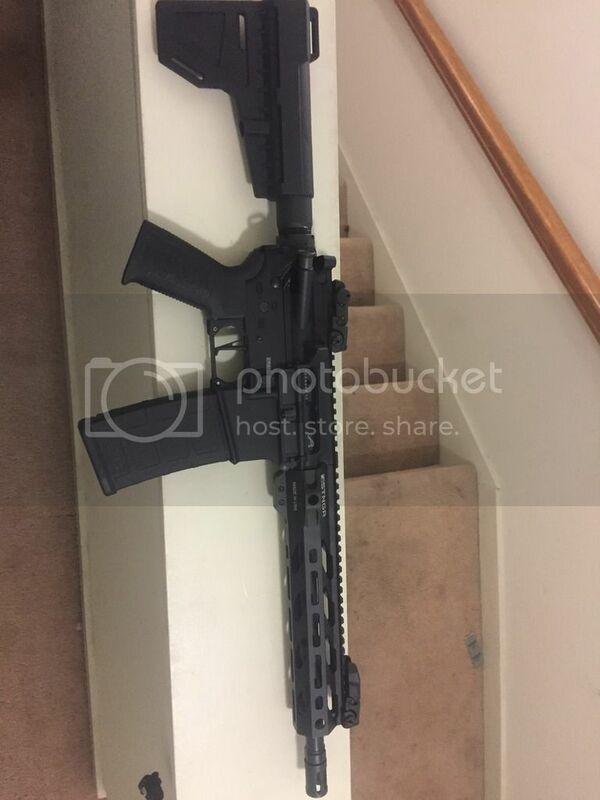 I’m pretty sure if your oal is >26inches you can have a vertical grip, can anyone verify? jb2012 wrote: Very nice, similar to a build I just finished, except mine is chambered in 5.56. Still need an optic and flashlight, but this will be mostly used as a home defense weapon, and for some plinking. If it's less than 26" overall length and it has a vertical handgrip, it's an AOW. If it's more than 26" overall length and it has a vertical handgrip, it's a Title 1 firearm (non-NFA). If it's more than 26" overall length and it has a vertical handgrip and it's concealed on the person, the ATF says it's an AOW. They're been smacked down in court before over that sort of nonsense, and it's fundamentally the same "use defines reality" garbage they said about Sig Braces with SBRs, but it's still what they say. Thanks, that’s what I was thinking. I have no plans to conceal this thing, so that shouldn’t be an issue haha. 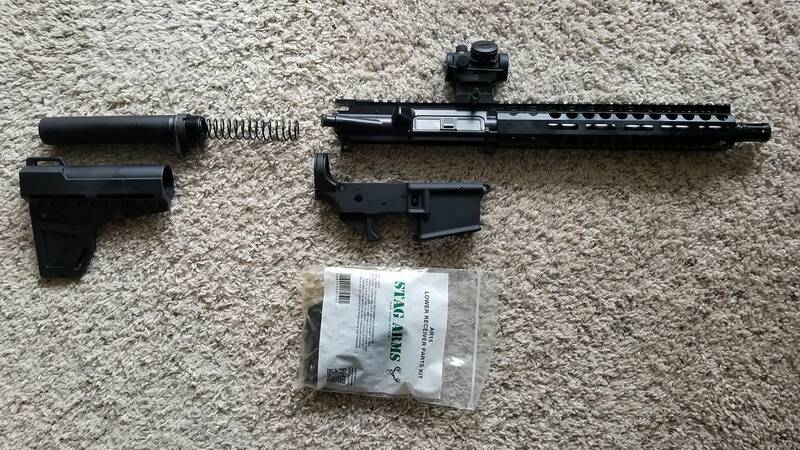 I'd be able to give you a better idea after I've put some rounds through this one, but the build-quality of the Radical upper seems decent so far. So if a vertical foregrip classifies it as an AOW, but a handstop does not, then what about an angled foregrip? What if they called it an "ergonomic handstop"? Anderson (FDE)/PSA(Blue) lower, Ground Zero Precision Ballistic Advantage 9" parts kit (Trenton, TX), KAK flashcan, Aero Precision M-lok hand guard, Shockwave brace, Trinty Force BUIS, Magpul MOE K2 grip (FDE), homemade quick adjust sling, Magpul FDE/German Blue Duracoat. These are our vehicle guns and fit in a Hazard 4 TakeDown bag nicely. I have a couple of bargain red dots that I'm going to co-witness. 20 round Magpul in the magwell and three 30 rounders in the middle outside pocket. Sorry for the poor picture quality. I was taking them for insurance records. As initially built with some clunky BUIS that were quickly discarded. Very nice rigs. My plans were to use the 20-rounder mag in the gun as soon as I can get one, but it's nice seeing the same mindset. 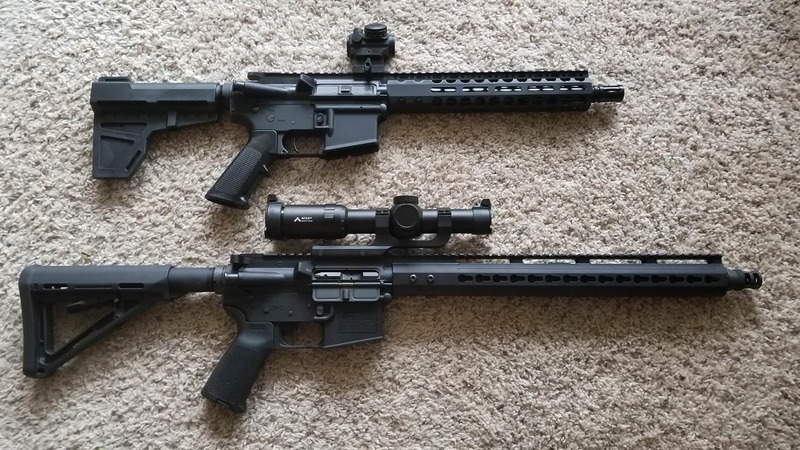 makes sense, because I think I've seen an AR Pistol set up with an angled foregrip now that I think about it, because I asked the guy if it was a pistol or an SBR and I'm pretty sure that he said that he didn't want to deal with any of the NFA stuff. I like the 20 round magazines. They keep the pistol a little more compact, fits the bag well, and still provides 20 rounds immediately. I figure if I have to get to the 30 rounders then things are not looking good and compactness isn't going to matter much. What red dot are you running? Is the 16" a 300 also? +1 for 20 round mags. Don't like the 30's for any kind of longer distance shooting as if trying to rest the gun it will rock on the longer mag. For close quarters I find the 20's easier to manuever with...just my $.02. Still like the 30's for my 5.56 full size carbines.